One of the vegetables that virtually disappeared from my kitchen last year was the white potato. Not to say that we never serve a loaded baked potato or have french fries with burgers--we just do so a lot less frequently than we used to! Sweet potato fries, or breakfast hash with sweet potatoes are our usual "potato" side dishes these days. Yesterday, I wanted to make a sweet potato hash for breakfast--but, I had no sweet potatoes. I did; however, have a butternut squash that I intended to roast for a weekend soup. 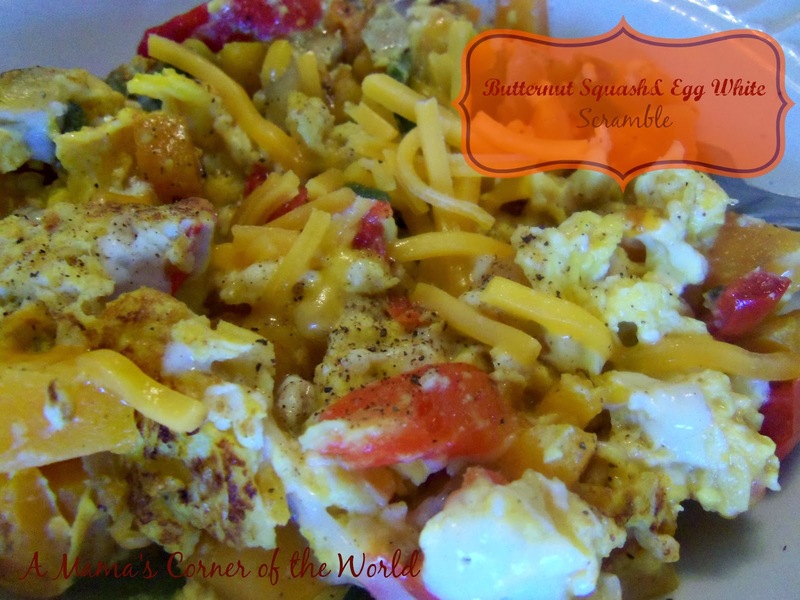 Since breakfast hash sounded better than soup--I decided to give squash and eggs a try! Not only does this make a yummy Meatless Monday breakfast--but, it is certainly hearty enough for a later meatless meal as well. Prepare the butternut squash, pepper and onions. Make sure to dice the squash into tiny 1/2 inch or smaller pieces to allow for faster cooking. Heat 1 tsp. desired cooking oil in a medium, nonstick skillet until hot, but not smoking. Saute the squash over medium heat until they can be pierced with a fork--but, are not soft. Add in the peppers and onions. Saute until vegetables are tender. Mix in the hash ingredients. Add the remaining cooking oil (I use coconut oil or olive oil) to the skillet with the vegetables. Season with sea salt, pepper, and garlic powder. Pour in the beaten egg whites and scramble the mixture until the eggs are set. Garnish and Serve. Divide into four servings on plates. Sprinkle each serving with shredded Cheddar cheese. Serve warm with whole grain or Ezekial toast and fruit.